‘Waitress’ at The Kimmel Center. Never underestimate the power of pie – especially fresh-baked cherry pie. Just ask fans of the original “Twin Peaks” series. 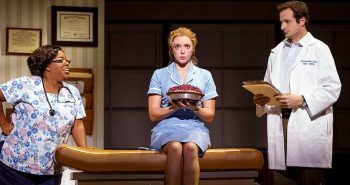 Pies play a role in the hot musical “Waitress,” which the Kimmel Center’s Broadway Philadelphia series in bringing to Philly this week for a six-day run at the Forrest Theatre (1114 Walnut Street, Philadelphia, 215-893-1999, www.kimmelcenter.org) from February 13-18. “Waitress” is a musical with music and lyrics by Sara Bareilles and a book by Jessie Nelson. The musical is based on the 2007 film of the same name, written by Adrienne Shelly who was murdered three months prior to the premiere. In November 2006, Shelly was found dead in her Greenwich Village work studio apartment. Police arrested a construction worker who confessed to killing Shelly and making it look as if she had committed suicide. The musical “Waitress” is nowhere nearly as grim as the story of its author. It tells the story of Jenna Hunterson, a waitress in an unhappy marriage to her husband Earl. When Jenna unexpectedly becomes pregnant she begins an affair with her gynecologist Dr. Jim Pomatter. Looking for ways out she sees a pie contest and its grand prize as her chance. 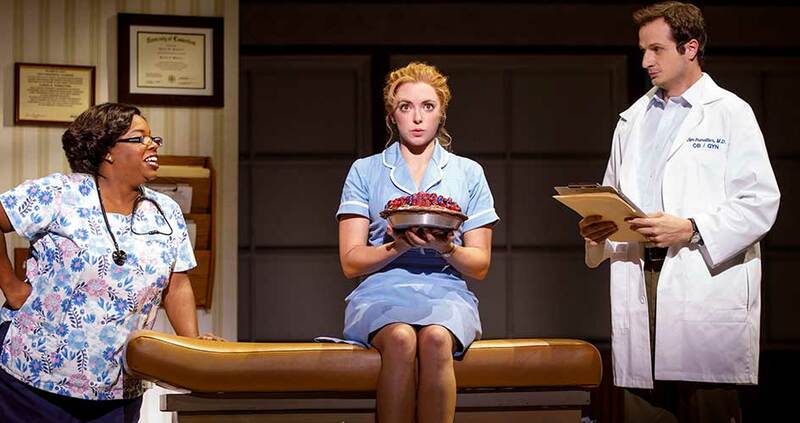 The original production of “Waitress” premiered at the American Repertory Theater in Cambridge, Massachusetts in August 2015, with direction by Diane Paulus and choreography by Chase Brock. It starred Jessie Mueller, Drew Gehling and Joe Tippett as Jenna, Jim and Earl, respectively. It made its Broadway debut at the Brooks Atkinson Theatre in April 2016. A U.S. national tour began on October 20, 2017. Brought to life by a groundbreaking all-female creative team, this irresistible new hit features original music and lyrics by five-time Grammy® nominee Sara Bareilles (“Brave,” “Love Song”), a book by acclaimed screenwriter Jessie Nelson (“I Am Sam”) and direction by Tony Award® winner Diane Paulus (“Pippin,’ “Finding Neverland”). Jenna, an unhappy waitress and expert pie maker, is stuck in a small town and loveless marriage. She is also faced with an unexpected pregnancy that may end her dreams of opening up her own pie shop. As fate would have it, she enters a baking contest in a nearby county and meets a handsome new doctor. With the help of a quirky crew of fellow waitresses and loyal customers, Jenna makes use of a secret ingredient she’s been missing all along and that’s courage. Desi Oakley will don an apron and bake across the country as Jenna in the national tour of “Waitress.” Among those joining her in the road production are Bryan Fenkart as Dr. Pommater and a trio of current Broadway cast members. “I auditioned for ‘Waitress’ this past summer,” said Oakley, during a phone interview last week from a tour stop in Baltimore. “I had seen the show before because it was so successful on Broadway. They were looking for a Jenna for the tour and I got an audition. Oakley first found her way to a stage when she was growing up in Wichita, Kansas. She made her principal debut as Dorothy in “The Wizard of Oz” at Music Theatre Wichita. Oakley also found it easy to bond with Jenna. “I love my character,” said Oakley. “She’s complicated in all the best ways. She’s kind and loving – and she’s messy. She has a lot of dreams, but they’ve been suppressed because of her circumstance. She’s a perfect example of the girl next door who overcomes obstacles and still chases love. “I’m able to give colors to Jenna because I’m real. I’m not a robot. The most challenging part of playing Jenna is that it’s a big role. I’m on stage the whole time – except for four minutes. And, like Jenna, Oakley loves pie. Video link for “Waitress” — https://youtu.be/5lFbfCVxl6E. “Waitress” will run from February 13-18 at the Forrest Theatre. Ticket prices range from $62-$132. 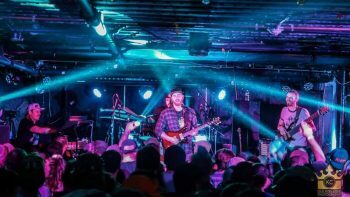 On January 30th, Ward returned to the headline spot when The Storm Tour kicked off in Salt Lake City with openers Billy Raffoul and Black Pistol Fire. With several U.S. headline tours, countless sold-out shows and buzzworthy festival performances already under her belt, Ward is a respected headliner. Ward, who now lives in Los Angeles, was born in nearby Abington in Montgomery County. Surprisingly, Abington has produced a number of artists who have been successful in show business including TV host Bob Saget, actors Joey Lawrence, Matthew Fox and Stephen Lynch, singer Alecia Moore (better known as Pink) and musician Steve Berlin of Los Lobos. But, Ward only lived in Abington as a young child and her family relocated to the Pacific Northwest. “I was born in Abington and then grew up in Bucks County — in Churchville,” said Ward, during a recent phone interview from a tour stop in Omaha, Nebraska. On February 13, Ward will return to the Philly area when she brings “The Storm Tour” to the Theatre of the Living Arts (334 South Street, Philadelphia, 215-222-1011,http://www.lnphilly.com). “It’s always special for me to play a show in Philadelphia,” said Ward. “I definitely feel an attachment to Philly. I still have friends from elementary school who come out to hear me play when I come there. It was there that Ward got interested in music. “My dad was in a blues band,” said Ward. “When I first started listening to the blues, the sincerity of the artists resonated in me. Something in their voices made me love the blues. “I was in my first blues band when I was 12 or 13. I’d come out with my Fedora on and sing Albert King’s ‘As the Years Go Passing By.’ I was also listening to hip-hop — Nas, Jay-Z — and the stories they were telling. Once in Southern California, Ward began making her own music — starting with the “Eleven Roses” mixtape in February 2012 and the “Criminal” EP in May 2012. Her debut full-length album “Til The Casket Drops” was released in October 2012. Almost five years later, she released “The Storm” in June 2017. “I actually made an entire second album – and then I scrapped it,” said Ward. “I felt like I didn’t go deep enough into my influence of hip hop and blues. Those tracks just went off into time somewhere. It was just a process. Every artist has a different process. “I wrote a whole new batch of songs that were good stories of my life. I tried to use the influence of blues and hip hop. The song ‘Cannonball’ was more blues. ‘Let It Burn’ is more a trap beat with slide blues guitar. I think I went further into the blues than I did on my first album. Blues and hip hop are similar in a lot of ways. My mind doesn’t think of genres when I’m writing. It’s more afterwards. I like that my music doesn’t fit in a genre. The show at the TLA, which has Billy Raffoul and Black Pistol Fire as the opening acts, will start at 8 p.m. Tickets are $23. While “Waitress” will have six days in the area, Strange Machines, a Boston-born, New England-based quartet will have two. Strange Machines is a band that has been around since October 2011 and has had two incarnations over the last six years. The current incarnation features Mike MacDonald (guitar, vocals), Christian Perron (keyboards), Isaac Civitello (drums, vocals), Craig Holland (bass). Strange Machines will share a bill with Tektonic and Grove Fetish on February 14 at MilkBoy Philly (1100 Chestnut Street, Philadelphia, 215- 925-6455,www.milkboyphilly.com). 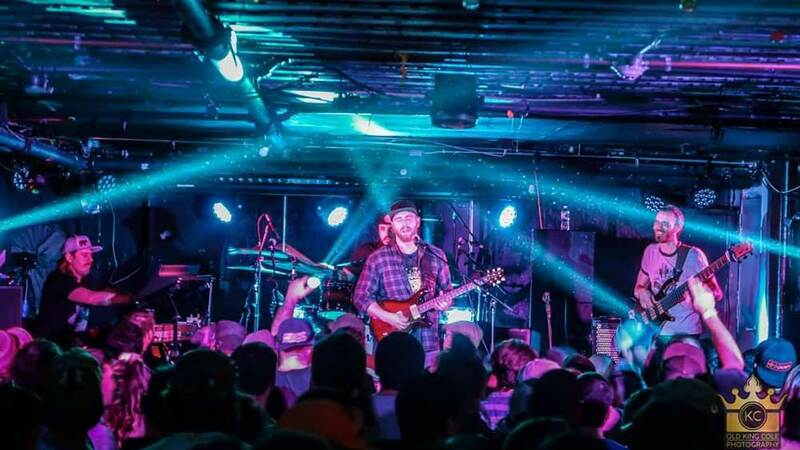 On February 17, the foursome from New England will headline a show at Tellus 360 (24 East King Street, Lancaster, 717-393-1660,www.tellus360.com). Strange Machines have been steadily making a name for themselves in the East Coast jam scene. What started as a band focused on rock and reggae has slowly evolved into a more diverse music group with a blend of music styles. “We’ve been together six years but we’ve had some personnel changes,” said MacDonald, during a phone interview Sunday night from his home in Boston. “I’m the founding member and Christian has been with the band a long time. “This lineup has been solid for the last three years. Two of us are from Boston, one from New Hampshire and one from Connecticut. 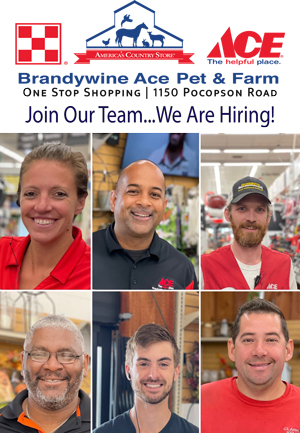 But, we’re based in Boston. “Me and my childhood friend Riccardo Braza started the band but he left three years ago. We found a couple other guys and started playing on. We didn’t really get serious about it until about three years ago. “We started out as a rock and reggae band. Now, we have that but we’re also super funky—and we have some heavy rock. We also play some electronica and jazz. Still, we try to keep our cohesive signature. Strange Machines is a favorite on the jam band circuit but is more than just another noodling jam. It is a band that rocks – and jams while doing it. “We jam a lot – more and more as time goes by,” said MacDonald. “Last night we did a show in Saratoga Springs, New York and got more exploratory than we’ve ever been. Strange Machines has released two albums. The first incarnation started with an LP titled “Turn the Tide.” The current line-up released its “Voice of Color” album last year. “The ‘Voice of Color’ came out in July 2017,” said MacDonald. “It was the first full-length with this line-up. We cut it at a studio in Milford, Massachusetts. The whole process took 8-to-10 months. It’s an 11-track album with 80 minutes of music. It’s pretty dense. Video link for Strange Machines — https://youtu.be/WZXcIrEqshU. The show at MilkBoy Philly on February 14, which also features Tektonic and Groove Fetish, will start at 8 p.m. Tickets are $12. Other upcoming shows at MilkBoy are Flux Capacitor and Broccoli Samurai on February 15, Kingfisher, Jutaun and Bison’s Big Bang on February 16, and Mr. Talkbox and Cory Wong on February 17. The show at Tellus 360 on February 17, which also features YAM YAM, will start at 8 p.m. Tickets are $5. Other upcoming shows at Tellus 360 are Joe Weitzel on February 13, The Willie Marble Experience on February 15 and Dirk Quinn Band with Mark DeRose and the Dreadnought Brigade on February 16.